I’ve always loved this picture. It’s fun seeing the shared joy of blowing out birthday candles and the anticipation of that wonderful homemade cake on everyone’s faces. But most of all I like the juxtaposition of old and young. The photo, like the celebration itself, bridges generations. 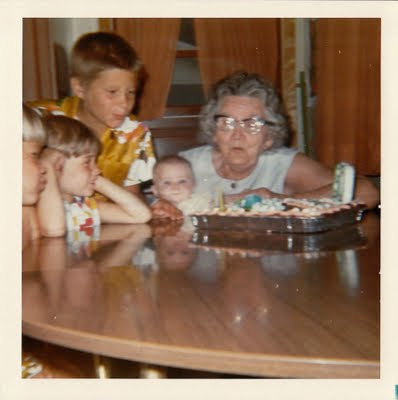 The picture was taken in 1971, on the occasion of my great-grandmother’s 80th birthday. 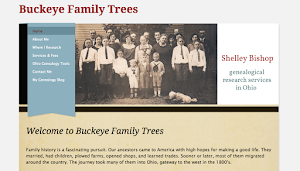 Mabel Seely was born June 22, 1891 to parents Samuel Seely and Matilda Adeline Wright in Columbus, Ohio. She married Harry Herrel, and one of their sons, Fred, eventually became my grandfather. I knew her only as Great-Grandma Herrel, a sweet yet seemingly ancient lady with a house full of little knick-knacks. She’s smiling in every picture I have of her. She died in 1975 at the age of 84. Sharing the “blowing out” honors with her are my brothers and two of my cousins. My other cousins and myself, my parents, aunts and uncles, and grandparents were at the celebration too, gathered at my grandparents’ house at Buckeye Lake. Wouldn’t it be nice to be able to slip back in time and right into an old photo like this? If only. Here’s to Mabel Seely Herrel, born 120 years ago this day. Happy Birthday, Great-Grandma!